Pyjamas or Pajamas – What’s the Difference? Home » Pyjamas or Pajamas – What’s the Difference? Some people wear luxurious silken clothing to bed, while some people wear cozy flannel. Others wear nothing. Regardless of the shape and style of the clothes one wears to bed, a single word can describe each outfit: pajamas. Depending on where you live in the world, you may have seen this word spelled either of these ways. It turns out that there is no difference between them in meaning, and the spelling you use depends on your language community. What is the Difference Between Pyjamas and Pajamas? 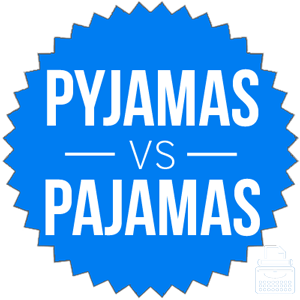 In this post, I will compare pajamas vs. pyjamas, and use each spelling in an example sentence. This way, you will be able to see them in their proper context. As part of a discussion on whether to use pajamas or pyjamas, I will also show you how to use a mnemonic device to remember how they differ. Spelling of pajamas: Pajamas are clothes worn to bed. It doesn’t matter which clothes they are—if you change into them before you get into bed, they are pajamas. Many children wear one-piece pajama suits, and some adults are content to wear an old t-shirt and some loose-fitting shorts or long pants. Other people have dedicated pajamas that fit comfortably and are made from soft fabrics. When Mark and Cindy had a daughter, they bought her pink pajamas with little ponies on them. Evelyn tried to make her dog Nicky wear pajamas, but the dog did not like to wear them. Pajamas is a plural noun—its singular form is pajama, which is a borrowed word from the Hindi language of Northern India. It has been part of the English lexicon since the dawn of the 19th century. Spelling or pyjamas: Pyjamas is a spelling variant of pajamas. It is chiefly used in British English, but it means the same thing as pajamas and appears in all of the same contexts. As you can see, pyjamas has always been more popular among British writers. Americans have flirted with this spelling as well, but settled instead with pajamas, which also appears to be gaining traction in British English. These charts aren’t exhaustive in their scope, however, since they only look at books published in English since 1800. Still, they are a useful gauge of how words have been used throughout the past two centuries. Since these words are the same in every way except for their second letter, the choice between them is driven by the language community of your readers. Since pajamas has an extra A, like America, you should have no trouble remembering when to use each version. Is it pyjamas or pajamas? Pajamas and pyjamas are spelling variants of a plural noun that refers to clothes people wear to bed. Pajamas is the American spelling. Pyjamas is the British spelling. 1 What is the Difference Between Pyjamas and Pajamas? Analog vs. Analogue – What’s the Difference? Shelf or Shelve – What’s the Difference?